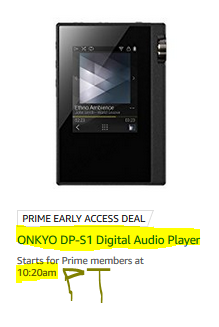 As promised in the schedule of the Amazonian Gold Box, this is now live, ending on Monday at 7:20pm eastern there is a lightning deal on the new condition Onkyo DP-S1 digital audio player for $179~ with free shipping.. The price before the sale is $250. The seller is “Electronics Expo”, fulfilled by Amazon, so free 2-day Prime shipping for members.